In the wake of an Axman murder case, the lives of a jazz musician, a police detective, and a corporate executive intertwine in 1918-19 New Orleans. ...ambitious and metaphorically dense... Rich, a resident of New Orleans, throws his arms wide open to history and to the city, and King Zeno, particularly in its first half, is as unruly and laterally active as a big urban novel ought to be. And the novel, like a city, somehow coheres, as Rich never loses control of the riotous raw material. The close third-person point of view rotates among three central figures, providing pattern and the promise of convergence; the mysterious ax murders serve as a narrative through-line; the canal exerts centripetal and allegorical force; and the extraordinary American yearning of the characters... Despite his large canvas, Rich is a gifted portraitist of his three main characters ... This is a novel with a high body count, but it has far too much energy ever to feel morbid ... The resolution is exciting and tense, and yet after all of the novel’s artful chaos, it feels like a diminution. Has anyone written the Great Novel of New Orleans? 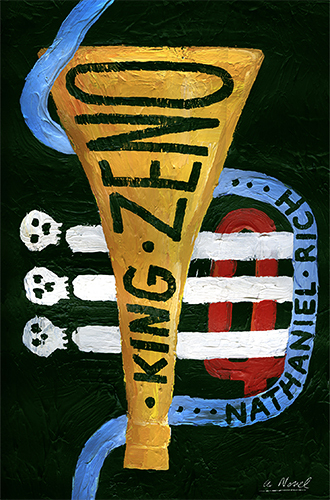 If not, Nathaniel Rich’s sprawling, funny, tragic, generous new work, King Zeno, comes close. It reminded this reviewer of John Dos Passos’ U.S.A. trilogy, with its clever melding of real and fictional events, its snippets of newspaper articles and astonishingly memorable characters ... Like the U.S.A. novels, the action in King Zeno takes place around the time of World War I ... Rich not only knows these folks and their loved ones, but he also knows New Orleans. He loves the honky-tonks, cathouses and bayous, the names of its streets and even the fetid mud and miasmic summer heat. He is cognizant of the city’s racial hierarchies... Readers will genuinely worry for Isadore and his friends, ever threatened by this sledgehammer of racism. Because of this, the ending is a nail-biter — with a twist. New Orleans in 1918 is the messy and exciting setting of Nathaniel Rich’s King Zeno. In Mr. Rich’s Crescent City, Creole cornet player Isadore Zeno labors at backbreaking day jobs in order to support his pregnant wife, while also trying to serve his artistic muse ... Mr. Rich tells a complicated story with great skill and style, sketching the mental lives of a dozen major characters and bringing a vanished era to colorful and realistic life. Despite the social inequity, dreadful hygiene and lack of penicillin, it’s refreshing to spend time in a milieu where jazz (or 'jass') music can provide a path to moral triumph. What did you think of King Zeno?